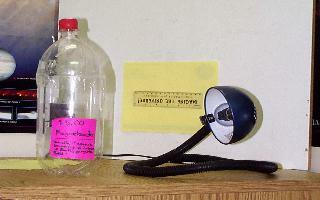 Students will build and operate a simple magnetometer using a soda bottle and a bar magnet. They will use it to monitor changes in Earth's magnetic field. They will study magnetic storms and investigate their properties in time and space. They will make measurements and perform simple statistical analysis. The NASA, IMAGE satellite program's public outreach and education project, POETRY has developed an inexpensive experiment that lets students monitor changes in the Earth's magnetic field in their classroom, and to look for signs of magnetic storms like the spectacular storm we had on July 15, 2000. Even if you do not normally see aurora where you live, changes in the earth's magnetic field can be monitored for signs of magnetic storm activity triggered by solar activity. We invite you to read the accompanying documents that describe how to set up the experiment, and how to use it in your classroom. Students can compare their own classroom observations with simultaneous satellite observations by NASA's IMAGE satellite, and track magnetic storms. By visiting the NOAA Space Environment Center you can see if any geomagnetic storms are in the 3-day forecast, and plan your student observing schedules accordingly. If you prefer not to incorporate this project into your curriculum, why not suggest it to a student as a Science Fair project? Many students have already built and operated the magnetometer for long-term studies with award-winning results! This resource has been selected by the National Science Teachers Association sciLINKS program. This Web page was identified as a high-quality resource by the NSTA only after going through a rigorous process to ensure that its content is accurate, and especially useful to teachers and students.